IS THERE ANYTHING more delicious than pasta? How about layers of pasta with succulent meat, rich tomato sauce, fresh herbs and lots of cheese? Yes, we’re talking all things lasagne. It might be surprising that while widely recognised as a classic Italian dish, lasagne actually originates back to ancient Greece. The Greek word ‘laganon’ meant an assembly of flat sheets of pasta and sauce, with no meat or other ingredients. There are many variations on everything that goes into a lasagne from the type of meat used to the variety of tomatoes. Whatever the flavour combination, we’re eternally grateful for this deliciously satisfying dish that is also incredibly versatile! Hungry yet? Check out our favourite lasagne recipes below. 1. Low Carb Turkey Lasagne, from Natural Born Feeder: This recipe is high in protein, low in fat and uses only a handful of ingredients, making it a great alternative to the classic lasagne if you’re stuck for time and want something light. A delicious healthy take on a family favourite! 2. Veggie Lasagne, from Kinneagh Kitchen: This is a very simple to make lasagne that would be ideal for a quick meatless Monday supper. While we love the veggie combination used here, any type of veg would work well, making it a great recipe to help clear out the fridge! 3. Classic Lasagne, from Gino D’Acampo: Is there anything more satisfying than a traditional lasagne al forno? Gino recommends letting the lasagne sit for a good 10 minutes before serving, allowing it time to firm up. Serve with some crusty garlic bread and a green salad for an impressive dinner. 4. Italian Sausage and Kale Lasagne, from Jess Fuel: A flavourful and satisfying lasagne with layers of spicy Italian sausage, kale, and cheesy sauce. This is an indulgent dish that can be prepared ahead of time and baked just before you’re ready to eat! 5. Butternut Squash and Sundried Tomato White Lasagne, from Half Baked Harvest: A guaranteed crowd pleaser when it comes to veggie dinner parties. Layers of cheesy, butternut squash goodness… it doesn’t get any better! 6. 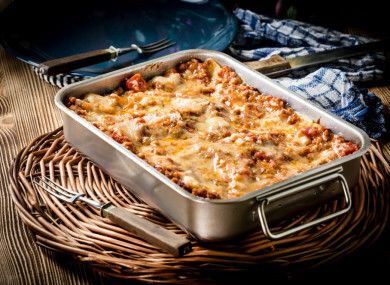 Beef Brisket and Porcini Lasagne, from Em’s Food for Friends: Beef brisket is an economical and tasty part of meat, but this can easily be substituted for most other cuts of beef. The addition of porcini makes this recipe a little bit extra fancy, making it ideal for entertaining. Email “6 of the best... twists on the classic lasagne”. Feedback on “6 of the best... twists on the classic lasagne”.